In it's own garden away from the hustle and bustle of cental Alanya, the well equipped Gorgulu Cleopatra's Beach offers an ideal holiday. The hotel faces the coast and has its own private beach. The resort centre of Alanya is located 1.5 kms away with a wide selection of shops, bars and restaurants. The airport of Antalya is just 120 km away. Reception (safety box payable locally) * lobby * restaurant * pool bar * beach bar with à la carte restaurant * outdoor swimming pool with children's section * sun terrace. Fitness * table tennis * beach volleyball * darts * irregular entertainment programmes * disco * children's playground*Sauna * billiards * Turkish bath * massage * water sports * jacuzzi * table football * diving school. Turkish bath, jakuzzi, sauna, massage, billiards, water activities, all imported drinks, minibar, roomservice, icecream, safe box, fresh fruit juices. internet, beds and parasol on the beach and a la carte restaurant. Air-conditioning * telephone * minibar * satellite TV * bathroom (WC + shower + hairdryer) * balcony. 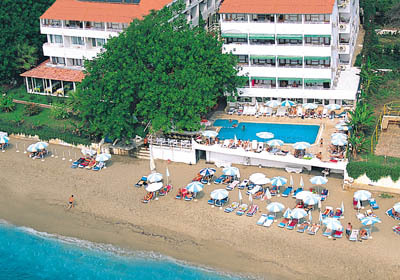 The hotel is situated directly on the famous sandy Cleopatra's beach. Sunbeds and umbrellas chargeable. Open Buffet breakfast, lunch and dinner. Late night soup between 23:30-24:00. Turkish snacks between 13:30-15:30. Tea and cake time between 16:30-18:00. Unlimited local alcoholic and soft drinks between 11:00-23:00. Fitness center and animation show 3 times a week.